Carpeted Stairs can cause serious accidents. 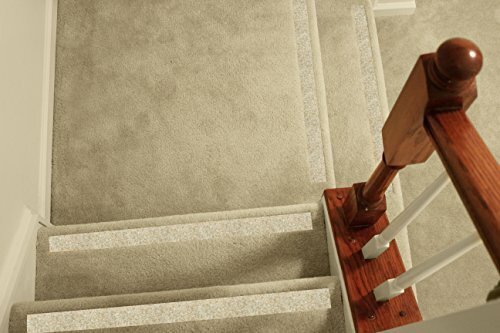 Protect yourself and loved ones by installing discreet and durable No-slip Strips nosing near the edge of each carpeted step so your foot won't slip. The strips stop your feet from slipping by providing just the right amount of friction. It is safe to use on any carpet. Installs over Existing Carpet. Completely REMOVABLE. NO CUTTING, No Gluing. Easy Do-It-Yourself installation. Patented Design is thin and flexible so it conforms to the shape and height of your carpet during installation. Will not break. Does not interfere with carpet cleaning. Clean with a damp cloth. Everything Included: aluminum Base-Strips, retaining Screws, Traction-Tapes, and detailed Instructions. How It Works: The aluminum "Base-Strip" stabilizes the soft carpet and padding. The patented design is durable, thin and flexible so it conforms to the shape and height of your carpet during installation. It will not break. The peel-N-stick "Traction-Tape" provides the non-slip grip so your foot does not slip. INSTALLATION: Do-It-Yourself installation. A power-screwdriver is required. STEP 1. Place aluminum Base-Strip about 1.5 inches from the edge of carpeted step and secure with retaining screws. STEP 2. Apply peel-N-stick Traction-Tapes on top of secured Base-Strip. That's it! HOW TO ORDER: Measure the length of each step (longest side of step, left to right) and subtract 6 inches. The result is the maximum recommended length to order. Yes you may order a shorter length. Color is "Beige-Gravel"; see 3rd picture. Size is 34 inches by 2 inches (Length x Width). Thickness is 0.04 inches. Quantity is 5 strips. Safe to use on any carpet. Installs over Existing Carpet. Completely REMOVABLE. NO CUTTING, No Gluing. Easy Installation, Do-It-Yourself. Patented Design is thin and flexible so it conforms to the shape and height of your carpet during installation. Will not break. Feels sturdy under your foot and provides SOLID non-slip traction. Traction is Medium Grit. It is NOT SOFT. It is NOT CARPET. Feels like very low grit sandpaper but not sandy, feels more organic and earthy and with very good traction that exceeds OSHA and ADA guidelines. You can order evaluation samples (B00FI3WHC8). No more slipping on your carpeted stairs! Manufacturer: Answer View Technologies Inc. Publisher: Answer View Technologies Inc. Studio: Answer View Technologies Inc. If you have any questions about this product by No-slip Strip, contact us by completing and submitting the form below. If you are looking for a specif part number, please include it with your message.